The Kansas Department of Education (KSDE) says it will take another $364 million to satisfy the Gannon VI finding of inadequate funding, but based on the court’s own test of adequacy, there’s no legal basis for more school funding. In its June 2018 ruling on Gannon VI, the court said the state owes inflationary increases on the funding hike approved this year in Substitute for SB 423 and House Substitute for SB 61[i]. The rationale goes something like this: the State’s approval of $522 million more in 2018 is tantamount to admitting that funding should be at the level now, so taxpayers owe schools additional inflationary increases since the funding is being phased in through 2023. But the Montoy Base State Aid amounts weren’t based on achieving the Rose capacities, which didn’t become the new standard until 2014. The basis for those numbers was a 2001 Augenblick & Myers cost study, in which the authors admittedly deviated from their own methodology by ignoring efficient spending and thereby produced artificially high numbers. Since the $522 million offer wasn’t based on the court’s new test of adequacy, there could be no valid determination that that amount is due today under the new test of adequacy – and therefore no inflationary increase is owed. Legislators already increased school funding by more than $1 billion over the last two sessions, which wasn’t necessary to improve student achievement. 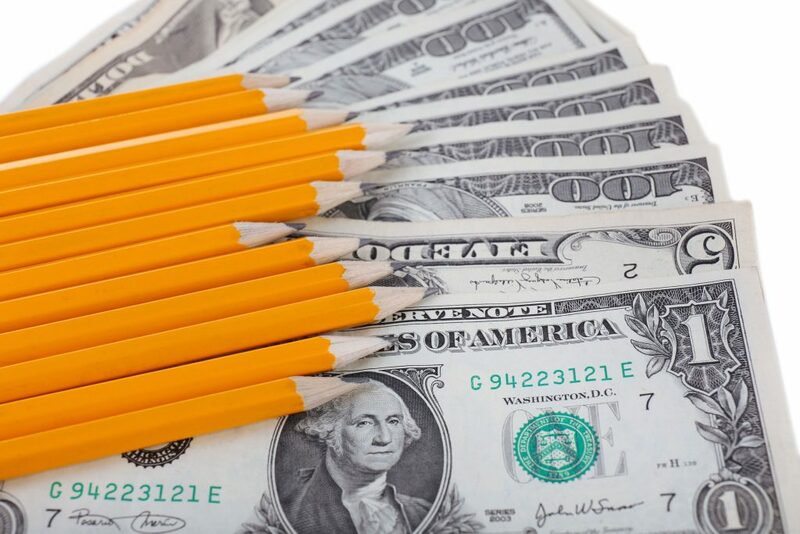 Quite a few states get the same or better outcomes on independent national tests while spending thousands of dollars less per-pupil than Kansas, which will soon exceed $15,000 per-pupil. Schools don’t need more money; they can and should make much better use of the money already approved. 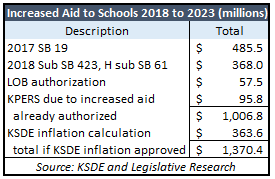 [i] The State and the court reference $522 million being provided in Sub SB 423 and H sub SB 61 but in the table shown above from KSDE and KLRD, some of that increase is attributed to an extension of SB 19.